Sunflowers (Helianthus Annus) are easy to grow and are synonymous with summer and sunshine. They are bold and strong and brighten any garden or vase of flowers. They are also a favourite in the Crafty Hippy household. 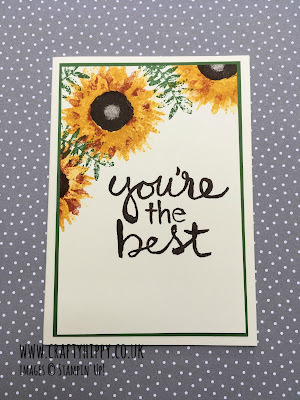 Check out these 10 beautiful sunflower cards made with products from the Painted Autumn Suite by Stampin' Up! 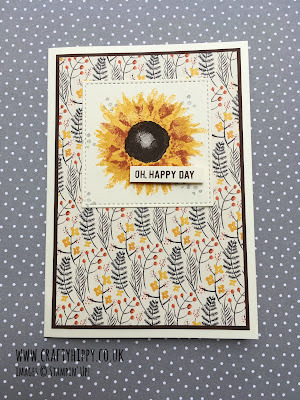 This gorgeous card is actually a CASE of a card in the Stampin' Up! Autumn/Winter Catalogue (page 48). It's Mr Hippy's birthday on the 28th so I have changed the sentiment and personalised it with his name using the Labeler Alphabet stamp set. I used the 'Enjoy your special day!' sentiment from Dragonfly Dreams, and our wooden Touches of Nature Elements. See more HERE. I really enjoyed creating this card. 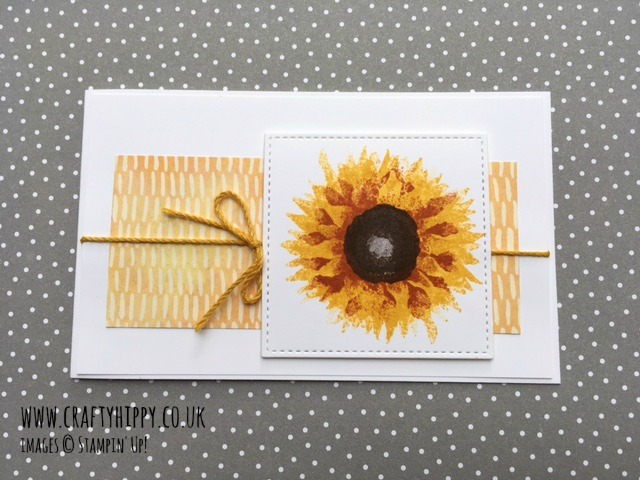 I used lots of Painted Autumn Designer Series Paper - the strip down the middle and the fussy cut sunflowers. A shock of Crushed Curry Solid Baker's Twine finishes the flowers off beautifully. The sentiment is from Thoughtful Banners, and stamped in Chocolate Chip. This is another gorgeous CASE card from the Autumn/Winter Catalogue (page 48). This is so simple to make and the Crushed Curry is a striking partner to the Garden Green. The sentiment on Crumb Cake Cardstock really finishes the card off. The perfect card for when you're in a hurry. 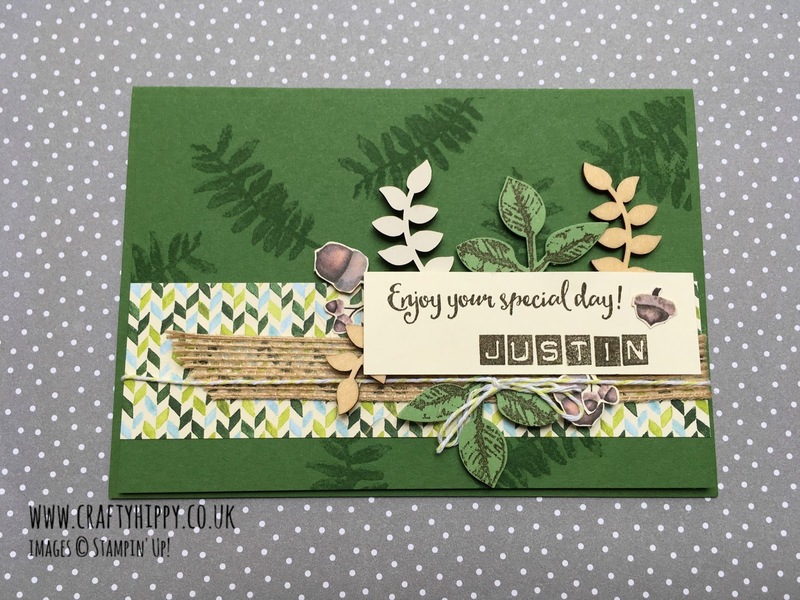 The gorgeous shades of green in this card are provided by the Garden Green Cardstock leaves (which have been cut out with the Leaf Punch), and the Old Olive Mini Chevron Ribbon. 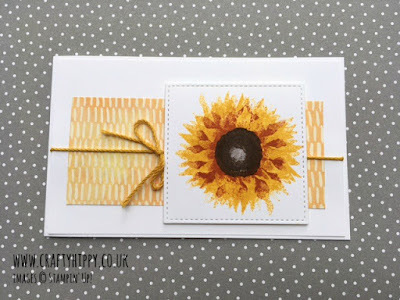 The Painted Autumn Designer Series Paper provides some extra colour. This is a beautiful card - replace the sentiment with a 'Happy Birthday' for garden lovers. The nicest thing about this card is its simplicity. Sometimes less really is more, and CAS (Clean and Simple) cards are bang on trend. Our Stitched Shape Framelits cut and edge your cardstock perfectly, making a feature out of the simplest of shapes. The sentiment is from the Dragonfly Dreams stamp set which compliments the Painted Harvest stamp set perfectly. Make someone happy with this quick and simple card. Learn more HERE. This card has all the shades of Autumn! This is the perfect card for dropping a cheery 'hello' to a neighbour, or for those last minute birthdays. Not every card has to have a sentiment. 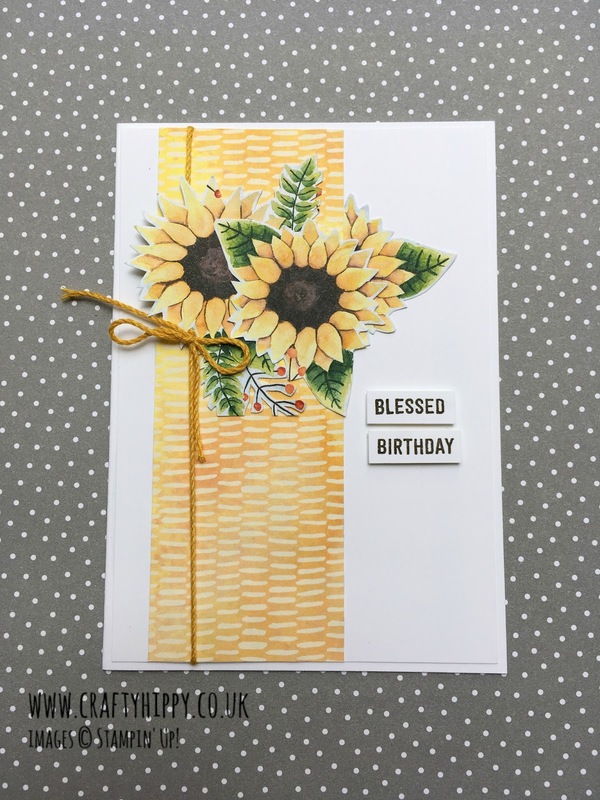 The Painted Harvest stamp set dipped in Cajun Craze over Crushed Curry creates the perfect sunflower effect. The Painted Autumn Designer Series Paper makes the perfect backdrop for card front windows. Choose any pattern and layer over with your sentiment. This time I've used the 'Gather together and give thanks' from the Painted Harvest set. Change the sentiment for birthdays, anniversaries, invites and thank yous. The Garden Green Cardstock compliments the Chocolate Chip ink. You can view this project in detail HERE. 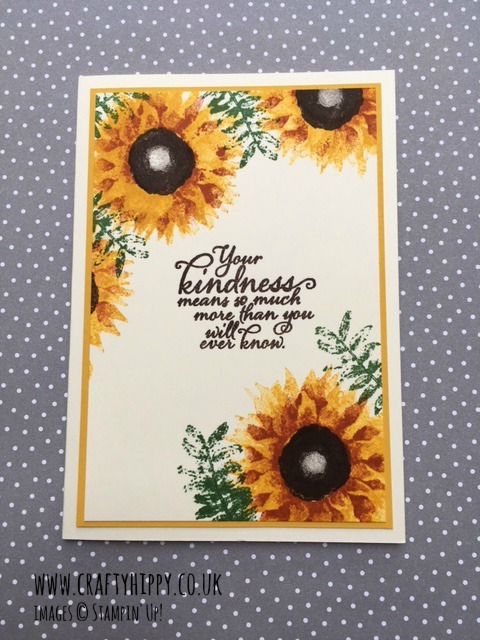 Make a bold statement with the large sentiments from Watercolor Words. Nothing makes someone feel better than telling them that they're the best! A shock of Garden Green Cardstock at the edges makes for a garden-inspired card. The rich hue of Chocolate Chip is a warm addition - this card is perfect for sunflower lovers and gardeners. You can view this project in full HERE. 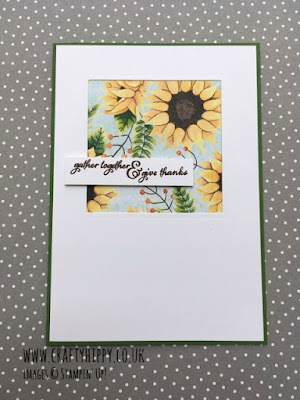 This beautiful card is chock-full of sunflowers. It is vibrant and cheeful and will brighten anyone's day. 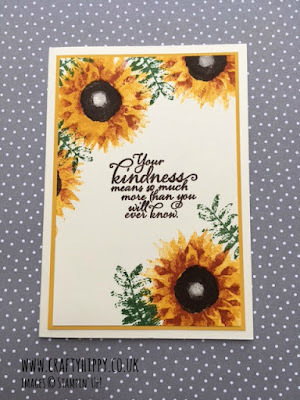 The sentiment is from the Painted Harvest stamp set, as are the sunflowers. 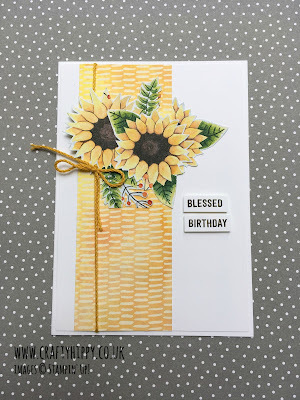 This is a quick and easy card to make but visually packs a punch. 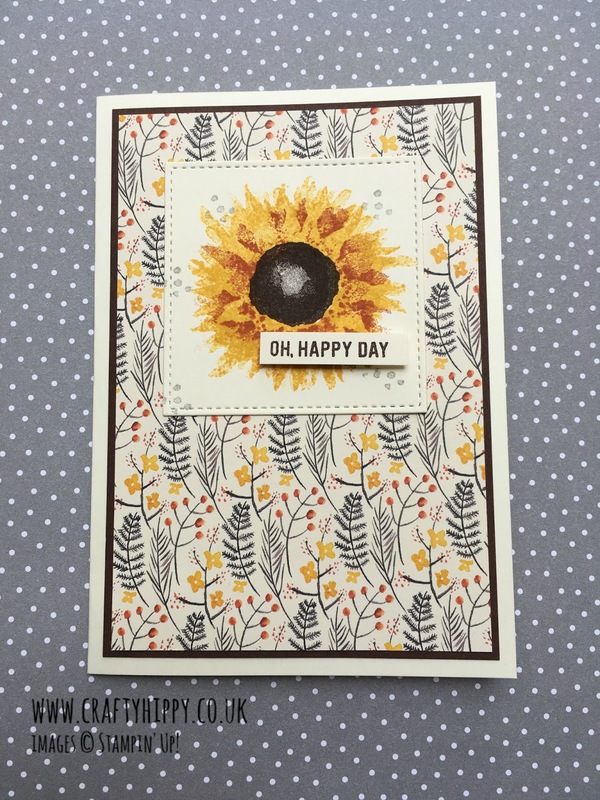 This card perfectly showcases the Painted Autumn Designer Series Paper. 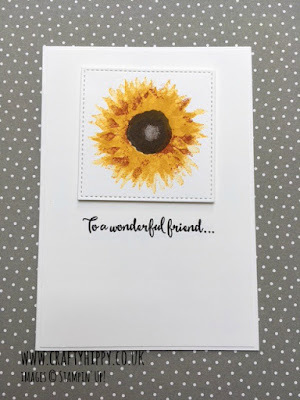 It would be easy to think that brown is drab but the Chocolate Chip Cardstock actually accentuates this gorgeous paper and co-ordinates beautifully with the centre of the sunflower. The sentiment is from Thoughtful Banners and creates a very flexible card - you could gift this for just about any occasion. And yet again our Stitched Shape Framelits add that extra finishing touch. You can get all the products you've seen today by clicking on the highlighted names or by checking out the Painted Autumn Suite. Press the Shop Now button at the top of the screen to check out the Stampin' Up! Official Online Store. The Painted Autumn Suite is perfect for scrapbooking, card making, memory making and home decor projects - the possibilities are endless. You are very welcome to CASE (Copy and Share Everything!) any project that you have seen today (or on this blog).